Sharon Trotter is a midwife and independent Parenting Consultant with special interests in breastfeeding and baby skincare. Sharon works independently to advise and promote best practice in these areas and has done for over 30 years. Following publication of her articles in various peer-reviewed journals, Sharon implemented a new policy for baby skincare within her local NHS organisation in 2004. Maternity units all over the UK and beyond are updating their policies in line with this simplified approach, now backed up by the Postnatal Care Guidelines (July 2006) published by NICE, where Sharon is a stakeholder National Institute of Clinical Excellence (NICE). She is also author of the bestselling book, Breastfeeding: the essential guide. In 2007 Sharon launched the unique TIPS Award Scheme, using parent testers who take part on a strictly volunteer basis, to provide parents with the most respected and impartial testing programme in the baby and toddler market sector. I set up this website in October 2002 so that my peer reviewed articles would be accessible to health professionals. I would like thank all the people who have contacted me since this web site began in October 2002. I now get emails from all over the world. If you have any comments or suggestions about breastfeeding, skincare or this web site, feel free to email me. Breastfeeding: the essential guide was published in 2004 by my own company ‘Trotters Independent Publishing Services’. The story of my road to publication was featured in the MIDIRS Digest in December 2004. Since first becoming available from Amazon.co.uk in November 2004, it has consistently featured in the top ten breastfeeding books from over 900 similar titles! Following an excellent review in the internationally respected ‘Journal of Human Lactation’ it is now available from the American giant www.barnesandnoble.com. Thank you to all my customers (old and new) I hope you are finding the advice useful. Last but not least we have some wonderful competitions for you to enter. Altogether our prizes are worth over £500 so email your entries to competitions@tipslimited.com and you too could be a TIPS winner! Last but not least we have some wonderful competitions for you to enter. Altogether our prizes are worth over £300 so email your entries to competitions@tipslimited.com and you too could be a TIPS winner! Welcome to the new look TIPS website set up by Sharon Trotter, Midwife and Parenting Consultant, to publish evidence-based information about breastfeeding, skincare, cord care and other midwifery-related subjects. We are thrilled to announce the results of the latest one off trial of Weleda Perineum Massage Oil. Designed for use during pregnancy, this oil has unique properties. More and more mums-to-be practise perineal massage and I was keen to see whether this could really make a difference. There has been little reliable research carried out on the benefits of perineal massage, so I wanted to ask real mums-to-be how they felt about using perineal massage as a way to help them prepare for their vaginal deliveries. I also wanted to know whether the use of Weleda Perineum Massage Oil could make a difference to their emotional and physical wellbeing. We also feature the TIPS Award winning Dribblebuster bib, and we have not one but five to give away! We feature three apps. The unique Flush Toilet Finder, is a very useful free app designed to help people find their closest public toilets. It works worldwide from an existing database of 100,000 public toilets but you can help update it for them on your travels. My daughter found our second app: Sleep Baby Sleep. This ingenious app provides six white noises parents can use to soothe babies to sleep. Using it is child's play and it really works! Sarah & Duck is our third app: it's the first official pre-school app featuring CBeebies' favourites (we reviewed a Sarah and Duck DVD in e-newsletter 33). We have reviewed two books: Breast Intentions: How women sabotage breastfeeding for themselves and others; and The happy sleeper: the science backed guide to helping your baby get a good night's sleep - newborn to school age. Last but not least we have some wonderful competitions for you to enter, including our main Newsletter Prize: a Weleda Gift Set containing all four maternity oils and the full range of Baby Calendula products (worth £120) plus 8 mini-competitions. Altogether prizes are worth over £300 so email your entries to competitions@tipslimited.com and you too could be a TIPS winner! Since our last newsletter in June we have published the results of our two trials: Sterilisers4All and the trusted Bickiepegs Teething Biscuits - which achieved not one but two TIPS Awards! We have also received a delightful review for the all-natural deodorant OY! by Green people. It was sent to us by one of our young testers. I have been busy writing many of the parenting articles for the second edition of a publication for new parents called The National Parent Guide. This will be available from local registry offices, many maternity units and parenting organisations. As well as our regular mix of featured articles (our updated TIPS Toolkits on Breastfeeding, Tongue-tie and Introducing Solids), blog (Grace under pressure), event (our family wedding! ), DVD (Philomena), Top Value (ReadyBed®s by Worlds Apart) and Top Treat (Weleda Haircare range) - not forgetting our campaign feature which highlights the fantastic work carried of Independent Midwives UK. Our video clips feature the work of neonatal nurse Sonia Rochel. By watching the beautiful footage of newborns being immersed in warm water baths, we are given a unique view of a baby’s recent life in the womb. Last but not least we bring you part four of our regular feature Diary of a Student Midwife Down Under. •	Adventures in Potty Training is about two neighbours who decide to start potty training their children on the same day. It also deals with the very sensitive subject of soiling. The book has been reviewed by one of our parent bloggers whose daughter has also suffered from this upsetting condition. •	in the Let’s Talk About series of toddler books, we have reviewed My New Baby and Big Beds and Bedtime for you. In our Top Tips features, you can find out about Train with Nicola Buggy classes - to help new mums get fit with their babies. We feature the adorable Frilly Tushies: a beautiful range of pants to hide nappies that take the old fashioned idea of frilly pants and give it a modern twist (we have two gorgeous sets up for grabs) and we also introduce the innovative craze of Mummy Business Cards. Check out our delightful Testers' photos including the very first engagement picture: my daughter and her fiancé (who proposed on top of Mount Kilimanjaro!). My Story includes poignant shots which chart the journey of Julie and her family, from diagnosis to treatment for thyroid cancer, just after the birth of her third son. Don't forget to check out our 8 mini-competitions with a total prize value of over £350! Email your entries and you too could be a winner. Our testers have been busy reviewing products and completing surveys. Their feedback is vital for companies developing new products and for other parents too. We are delighted to announce our first two 2013 TIPS Awards for the innovative Jackson Reece Nose Nuzzles - see our featured products section. Biovault Family is our featured event as they celebrate ten years as a clinical tissue bank. It's almost five years since my article ‘Cord blood banking and its implications for midwifery practice: time to review the evidence’ was published in the Midirs Digest. I felt this event provided the perfect opportunity to revisit the topic of cord blood banking and answer any questions you may have. To mark 10 years as a tissue bank Biovault Family have kindly offered TIPS readers the chance to save £150 off the cost of cord blood banking. If you would like to take advantage of this offer all you have to do is quote TIPS10 when you apply for Biovault services online and the discount will be applied. Check out our delightful Testers' photos including a wonderful selection of pictures that celebrate the home birth of baby number three for one of our loyal Parent Testers. We also have a very special breastfeeding clip showing a perfect latch. Maybe you have photos of your own you would like to share with us? Remember we're always on the lookout for these - and I will send a signed copy of my book (Breastfeeding: the essential guide) to the sender of each photo we publish. As well as our regular mix of featured apps, charity, article, Top Value and Top Treat our latest My Story follows a mum’s journey as she tries to get a diagnosis of tongue-tie, treated by snipping. We also have part two of our newest feature Diary of a Student Midwife Down Under. Don't forget to check out our 10 mini-competitions with a total prize value of over £500! Email your entries and you too could be a winner. In between playing nurse, physio and cake maker (vital for a quicker recovery! ), I have still managed to find time to complete our latest trial of the SnoozeShade® range of products which you can check out in our featured products section. Once again we have a comprehensive selection of features for you in this e-newsletter. We have reviewed two websites. Aupairads (www.aupairads.com) was set up by two Swedish au pairs and provides a network where parents and au pairs can find their perfect match. It is a unique solution to meet the demand for Scandinavian au pairs from Sweden, Finland, Norway, Denmark and Iceland. Aupairads are offering our readers the chance to win one of two ads worth €39 each. The second website is www.tractorted.co.uk. Tractor Ted in Tractorland teaches children from two to six years old about farming and countryside activities such as where good food comes from, the seasons and how to care for animals through DVDs, books, toys and live events. Check out our newsletter competition to win one of ten Tractor Ted DVD and Book sets. Check out our delightful Testers' photos including some funky pictures of twin boys from Australia and another amazing 4D scan. Maybe you have photos of your own you would like to share with us? Remember we're always on the lookout for these - and I will send a dedicated copy of my book (Breastfeeding: the essential guide) to the sender of each photo we publish. Our Top Tips include an innovative website for parents of primary school children. Keeping Up With My Kids is the brainchild of Claire Coles, mother of two and full time primary teacher of 9-10 year olds, who came up with the idea while on maternity leave. To help you out as the days get longer we feature Ten Rainy Day Activities courtesy of Galt Toys. We also feature the innovative product range from ICE Gems who have launched a new collection of medical ID wristbands and bracelets designed to help save a child’s life in an emergency. Our final Top Tip comes from Turn2us, an online resource that aims to help people access the financial support available to them – through welfare benefits, grants and other help. Check out a clever teaching product from Birth International. This fun and engaging hand puppet will help professionals demonstrate the latching of the baby for successful breastfeeding. Another first for TIPS – our online shop is ready to go live! After months of planning, we are delighted to announce that you will be able to buy products on our website. TIPS Testers and Members often ask where they can find TIPS Award-winning products, that's why we've decided to start selling them right here, on the TIPS website. 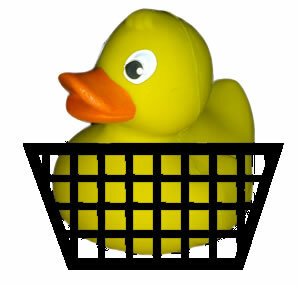 We are starting with a small selection of products: our signature latex ducky (you may have been following his travels on facebook); a personalised TIPS baby towel; the TIPS double Award-winning Jackson Reece baby wipes (Best of the best & Best eco-friendly) and the Tummy Tub (TIPS Best of the best baby bath). We will add products to the online shop to meet demand. Please email us at info@tipslimited.com if you can't get a TIPS Award-winning product and we will do our best to find it for you. Check out our delightful Testers' photos including my godson’s new baby daughter (makes me feel very old!). Maybe you have photos of your own you would like to share with us? Remember we're always on the lookout for these - and I will send a dedicated copy of my book (Breastfeeding: the essential guide) to the sender of each photo we publish. Our featured events are the innovative Jack & Jill Scottish Markets (where you can buy and sell baby products) and the first national safety day ‘The difference a minute can take’. Organised by home safety brand Lindam this campaign aims to raise awareness of childhood accidents and to help busy parents make their homes safer. On the subject of accidents, burns and scalds can have devastating long term consequences if you do not provide immediate first-aid. One of our Top Tips is a step-by-step guide to treating burns while you wait for medical help. We also feature a new campaign by The Bicycle Helmet Initiative Trust to make cycle helmets compulsory and to make roads safer for cyclists. Our final Top Tip features Osram’s latest LED light gadgets which can be charged with a laptop or PC. These highly energy efficient gadgets have many uses at home and away. We have two of these gadgets to give away. We have news of two excellent DVD launches. Small Wonders has been produced by Best Beginnings (a highly respected charity who provides invaluable advice and support to parents expecting or coping with the shock of premature birth). The second is the global launch of the eagerly awaited documentary Freedom For Birth – The Mothers Revolution on 20 September 2012 1000 screenings are planned all over the world on that day. This campaign aims to help to bring about change so that women all over the world are allowed to decide how they want to give birth. Our featured products include an ingenious weaning tray called the Tiny Diner (our Top Value) and news of our recently tested baby and toddler slings. You will also have the chance to win some of these winning designs in our newsletter competition. As well as our regular mix of featured apps (including a free download worth £4.99), charities, article, CD and Top Treat our latest My Story follows Aussie mum Nichola’s breastfeeding experiences as a mother of multiples and premature babies, and tri-andem feeding. We are delighted to announce that our 1000th Parent Tester recently registered online to take part in future TIPS trials. This coincides with the publication of our long-awaited trial results for our first standard trial of Slings for Babies and Toddlers 2012. 9 products were carefully selected for this trial. 62 test samples, supplied by 6 manufacturers were sent to 62 Parent Tester (the age range of baby and toddler testers was birth to 55 months old). Once again we have a packed issue including the long-awaited delivery of our TIPS® baby checklist that you, our Parent Testers helped us to develop. We talk a lot about safety in this issue, with articles about the safest car seats, the latest Lindam safety gate (we have two up for grabs in a mini-competition) and a video clip showing a step-by-step guide to using the epi-pen for severe allergic reactions. Our spring collection of testers photos is sure to delight and entertain you. Maybe you have photos of your own you would like to share with us? Remember we're always on the lookout for these - and I will send a dedicated copy of my book (Breastfeeding: the essential guide) to the sender of each photo we publish. We also feature the Bellabee website (www.bellabee.co.uk ) which offers the perfect gift solution for children of all ages. Each hand drawn painting is made to order, and guaranteed to brighten up any child’s bedroom or playroom. We even have a personalised Bellabee painting to give away! We have reviewed Hold it Mama, a book by leading Australian women’s health physiotherapist Mary O’Dwyer. New for this issue, we have also reviewed two apps: one for the childhood classic book: Dear Zoo and the other developed by Explore Learning to help children learn their times tables. We feature the most gorgeous selection of hand-knitted items by new company Picaloulou. We even have four baby beanies (worth £80) to win in our e-newsletter competition. As well as our regular mix of featured event, articles, and Top Tips, our latest My Story follows a new mother as she struggles to establish breastfeeding with her son who has tongue-tie. Last but not least, we know you will enjoy reading part 9 of our Diary of a Student Midwife. Don't forget to check out our 10 mini-competitions with a total prize value of over £400! Get your entries in to Brigitte and you too could be a winner. We are thrilled to have reached another magic milestone – our 800th Parent Tester has recently joined up and is already testing their first products. Congratulations to Sharon – a special parcel of goodies is on its way to you. When she signed up to take part in forthcoming trials, Francoise (pictured left) had no idea she was about to become a TIPS VIP. A parcel of goodies was soon on its way to surprise and delight Mummy and Daddy-to-be! As well as our standard trials covering baby baths, baby wipes, baby skincare, breast pads/treatments, nursing bras/tops, cuddle towels, decongestants and TENS machines we have recently added one-off trials. September 2008 – TIPS now has a brand new forum! I don’t know where the time goes! Already it’s September and so much has happened in the past few months. For all the news and latest info on recent TIPS trials you will have to check out the newsletters but the big news has got to be our brand new TIPS forum. This new facility went live on August 22nd and it is becoming the place to catch up with your friends and chat about all your parenting dilemmas (of which there are many!). Come and join us online where you can access the latest news, newsletters and post topics on anything you wish to speak about (within reason – please check out our forum rules first). After a few days news of our website had travelled and we suddenly had an influx of 140 new testers in two days! Registration had to be closed while we caught up but we are back on track now so pop across and see what you think. Just a few more registrations and we will be hitting the magic 500th! Stats are also up 25% and they are staying there which is great news for everyone! May 2008 – TIPS Awards are now one year old and the TIPS website continues to go from strength to strength. TIPS Ltd has been trading for almost four years. Following the re-launch of the website in March 2007 traffic has more than tripled! We are now regularly attracting over 4500 visitors a month (200,000 hits) from all over the globe. The new features, including a log-in facility, members’ area, test results, newsletter and online shop, are especially designed to attract even more visitors. Since the launch of the TIPS Awards Scheme, this unique independent testing programme has really caught the imagination of the public. Our ever increasing pool of parent testers (now over 500) have helped to complete trials of baby wipes, baby skincare products, baby baths, breast pads & treatments, cuddle towels, open cups, nursing bras, decongestants and TENS machines. We have more trials out as we speak and many more planned for the future. To see the latest results complete with detailed information on how each trial was carried out go to the TIPS award section of the website. This paper aims to update those who may be new to this subject, and reinforce the importance of the ‘less is more’ approach to neonatal skincare. It will explain why neonatal skin is delicate and more at risk of damage. It will also highlight the insidious and inappropriate marketing of baby skincare products, focusing on the use of ‘suitable for newborns’ terminology, in this hugely competitive (and lucrative) industry. Credible and evidence-based guidelines for neonatal skincare already provide professionals with the tools they need to drastically reduce the steady rise in infant skin conditions which appears to be co-incident with the introduction of manufactured baby products over 50 years ago (Cork 2002). However, with UK rates of childhood eczema among the highest in the world we need to go even further. We must insist that manufacturers of baby skincare products and the baby press liaise with non-aligned healthcare professionals to ensure that parents get accurate and consistent advice based on the national skincare guidelines. Keywords: neonatal, eczema, baby skincare products, water-only, skin barrier, vernix caseosa, oleic acid. @tipslimited.com for more information. As well as all the hints and tips you need about baby skincare, skin-to-skin contact and feeding but, this leaflet now includes the latest and safest advice on reducing the risk of cot death. Version 9 includes a handy QR code to use it with your smart phones. Email info @tipslimited.com if you would like a free copy. Read Sharon’s article: The festive dilemma for parents regarding baby skincare products and a Views on the News feature: A response to advertising used in baby skincare adverts. This award winning leaflet is distributed around the UK at various professional and parenting events. Supplies can also be purchased by health professionals or maternity units. Version 8 is hot off the press – please contact Sharon for details. Trotter S (2010). MIDIRS reviewer's comments. MIDIRS Midwifery Digest20 (2):263-5. 'Neonatal skincare is a subject I have followed with interest since 1996. My published work on this and related issues has changed policy within the UK and beyond with my goal of standardised evidence-based guidelines gradually becoming a reality. So when I was sent this article to review I was keen to find out if it contained anything new that would either support or discount the advice I currently provide to parents and professionals on babycare practices, based on the healthy term infant'. Version 7 (updated in line with the latest research) is now available. Sponsored by TIPS award winning company Halos N Horns this award winning leaflet is distributed around the UK at various professional and parenting events. Health professionals and maternity units can buy hard copies – email Sharon for more information. If you would like a free copy of this leaflet please email Sharon. BABY SKINCARE: BACK TO BASICS, NATURALLY - a seminar presented by Michael Bate (Weleda) and Sharon (TIPS Ltd) at the Natural & Organic Products Show. The seminar was a great success with lots of questions from interested delegates. Copies of Sharon’s award-winning Babycare – back to basics™ leaflets were given out in goody bags on the Weleda stand (see picture). Thank you to everyone who came along on the day and to all the wonderful feedback I have received since. Even if you missed the seminar you can still get your copy of the leaflet - just email Sharon. 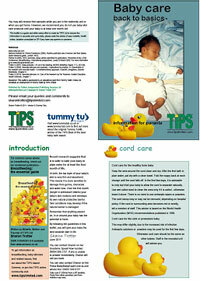 Baby care: back to basics™ leaflet Version 6 (updated in line with the latest research) is being printed as we speak. Sponsored by TIPS award winning company Jackson Reece baby wipes (www.jacksonreece.com) this award winning leaflet is distributed around the UK at various professional and parenting events. Supplies can also be purchased by health professionals or maternity units – email Sharon for details. This is not just a wonderful honour for Sharon and her tireless work in the field of neonatal skincare but adds weight and credibility to the growing evidence that a simpler regime for all babies and children really does make a difference. A special edition of the Babycare- back to basics™ leaflet is planned to promote this recent win. If you would like a free copy please contact us. You can find out more about the NIP Awards and the other winners on the day here or on the TIPS website. I am thrilled to announce that my first chapter in an academic textbook has just been published. Chapter 14 is entitled Neonatal skincare and cordcare: implications for practice. It documents the latest research, and highlights the most important findings, from my six published article on this subject. New guidelines for practice are explained, inline with the latest recommendations from NICE, and the chapter concludes with Jacqueline’s story charting her personal experience of how this new skincare regime had a positive effect on her children’s lives – Jacqueline is one of our very own TIPS testers. I can’t believe that version 5 of this leaflet is now available. This is now sponsored by not only one but two TIPS award winning companies: Halos n Horns and Weleda. It is distributed around the UK at various professional and parenting events. Supplies can also be purchased by health professionals – contact Sharon for details. Not only does this leaflet give you all the hints and tips you need on baby skincare issues but it now covers the latest and safest advice on reducing the risk of cot death. If you would like a free copy of this leaflet please email me. I was honoured to be presenting my work on baby skincare to other primary healthcare professionals at the London NIP Event. You will be able to download this presentation by checking out the NIP website. 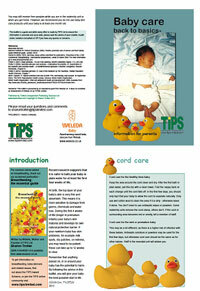 May 2007 - Version 4 of the Baby care: back to basics™ leaflet has just been printed. It gives up to date advice on safe skincare, and includes information from the articles I have published in professional journals. Copies of the leaflet will be handed out to parents and professionals at conferences and baby shows around the UK. You can also order copies of the leaflet by following this link. February 2007 - I was involved in the second MIDIRS Webinar on 8 February 2007. I hope to encourage debate on neonatal skincare and so that all maternity units in the UK to practise safe skincare for newborns using the water-only regime. The webinar went really well and was followed up in July with a feature on cup feeding and its associated risks. Have a listen and feel free to come back to me with your comments. September 2006 - It was gave me great pleasure to present my work on neonatal skincare to the third Annual Midwifery Conference at Robert Gordon University in Aberdeen. December 2005 - So much has happened in the past few months I can hardly keep up! Firstly I graduated with my BSc in Advanced Studies in Midwifery at the University of Paisley. It was the culmination of many years work and as you can see by the picture it was a magical moment. I am now busy working on my updated skincare paper and hope to have it published some time in the New Year. June 2005 - I am pleased to announce that I have completed my University course and will be graduating in November with a BSc in Advanced Studies in Midwifery from the University of Paisley. I would encourage any budding students to ‘go for it’ and get back into the academic routine. As part of my course I applied for two modules at level three through the APL (accreditation for prior learning) route. This simply means that my published work on skincare and cordcare (including the actual process of research used) was reviewed and credited towards my degree. This process was not without its difficulties and I intend to feature this shortly. I found it hard to find information on the APL/APEL programme and would like to help other students who are thinking of applying for accreditation for work previously carried out and relevant to their individual course. My statements of learning and written account (5000 words) can be accessed here. I hope this will help other students on how best to proceed. I have completed the audit at my local NHS unit following introduction of new babycare guidelines leaflet. The results are very positive and will be published shortly. I have also been busy attending conferences and baby shows around the UK spreading the word about my guidelines and introducing my book, Breastfeeding: the essential guide to parents and professionals. The official launch was held in Scotland on May 6th with the kind help of my guest of honour, Dame Lorna Muirhead DBE. A wonderful day was enjoyed by all and we raised an amazing £825 for the local Malcolm Sargent House, part of the UK Charity CLIC/Sargent. The event has been featured in the local and national press, alongside mentions in the Midwives Journal and the Practicing Midwife Journal. Thanks to everyone who supported me and who gave so generously to such a good cause. My recent ‘viewpoint’ article called ‘Skin-to-skin contact: treatment or therapy?’ was published in the conference issue of the RCM Midwives Journal (May 2005). This is based on the skin-to-skin article featured on this site. January 2004 - Since last updating this website in June 2003 a lot has happened with my skincare and cordcare work. I decided to go back to University and am now studying for my BSc in Advanced Studies in Midwifery. I never thought I would be back at school at the age of 42! Anyone else out there thinking about returning – GO FOR IT! I have been asked by the British Journal of Midwifery to write another article about Skincare/Cordcare and this is due for publication in the March 2004 issue. I will give the full reference when I have it. The article is called: Skincare for the newborn: exploring the potential harm of manufactured products.